Davenport might be small, but it is a charming town that offers a lot of perks to its locals. If you are new to Davenport, you will soon find there is a lot going on around the area. Davenport is the perfect place to raise a family because it is a small town near the flourishing Four Corners area – where Lake, Orange, Osceola and Polk Counties meet. The location is prime if you work in Orlando’s booming tourism industry, yet long for calm and a slower pace in your free time. Davenport is located only 17 miles from Walt Disney World Resort, and it’s a short drive to Universal Studios Orlando, SeaWorld Orlando, Gatorland and LEGOLAND Florida. People who love the outdoors will take pleasure in the parks and golf courses around the Davenport area, such as Providence Golf Club, Ridgewood Lakes Golf Club and Champions Gate Golf Resort. If golf isn’t your thing, you can take your family to enjoy a day on a vineyard picking blueberries at True Blue Winery. The winery also is home to the Blueberry Festival each April. The Hotel in Davenport gives visitors a homey atmosphere where they can enjoy breakfast, lunch or afternoon tea. Afternoon tea at The Hotel never disappoints with its tea, tea sandwiches, scones and desserts. Stop by the Flower Corner in the hotel, where you can find the finest floral arrangements and gifts to take home. The City of Davenport organizes seasonal events during Labor Day, Halloween and Christmas. Winterfest in December is one event you will not want to miss. This event gives families the chance to celebrate the holiday season by visiting Santa and Mrs. Claus, watching the night parade and decorating Christmas cookies. If you are a shopaholic, you are sure to enjoy Davenport’s shopping opportunities. 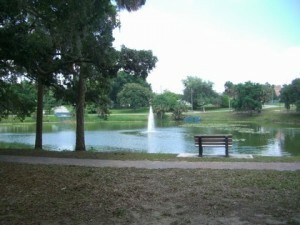 Posner Park is a shopping center located next to Interstate 4, which offers department stores and restaurants. If you are up for a full day of shopping, Davenport is only a 30-minute drive to the best shopping in Orlando, which includes the Orlando Premium Outlets, the Florida Mall and the Mall at Millenia. Here’s an interesting fact for history buffs and baseball fans: Posner Park is in the same location as the former Circus World amusement park, which was opened by Ringling Bros. and Barnum & Bailey Circus. Circus World became Boardwalk and Baseball in 1987. “Baseball City,” as it was known, attracted spring training and minor league baseball teams for the Kansas City Royals. Webb’s Candy Shop – enjoy the best goat’s milk fudge, citrus candy, chocolate and specialty candy. Webb’s began making homemade candies in 1932, and they still make their candy the same way they did 80 years ago. True Blue Winery – Polk County’s first winery that sells blueberry and fruit wines. You must try the Sweet Blueberry wine. If you want to participate in the u-pick dates, check the calendar on the True Blue Winery website. Sunday’s Grill – where else would you go to enjoy traditional British fish and chips? Sunday’s Grill is a family owned restaurant that provides families with a British experience with live football, beer and entertainment. Davenport Cafe – If you want good southern cooking, this place has the best country fried chicken in town. The cooks offer a different special dish every day. Sake – In the mood for Japanese? Sake is located in Posner Park and offers a variety of 42 sushi rolls including its signature Davenport roll. You and your family will love living in Davenport for all the activities and amenities it offers, as well as all the opportunities that are nearby. I hope I have enticed you to one of Four Corners premier spot known as Davenport Florida aka “Old Florida, just miles from Disney”. If you are looking for a home, perhaps a vacation home or a winter home – click on the icon right here below to see what’s in store for you.